Netrunner 17.06 DVD (64-Bit) | Linux DVD Shop - UK Linux Shop supplying Linux on CD, DVD and USB with Free UK Delivery, 24Hr Dispatch. 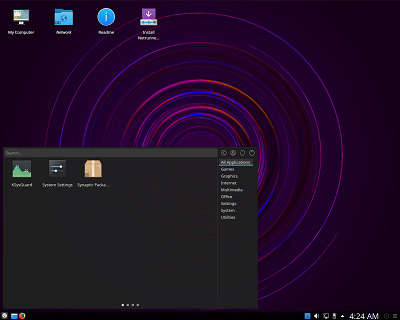 Netrunner Linux 17 for 64-bit on DVD, is based on Kubuntu and features a highly customized Plasma KDE desktop. It is designed for everyday use for new users and also those with more Linux experience. The development team has built and enhanced the desktop to give a unique look and feel as well as a user-friendly environment whilst still allowing the option to tweak to your specifications. Netrunner includes a popular mix of desktop applications and support for many multimedia codecs. There is also a free 2 GB account for its Cloud service - Runners-ID. This is based on the open source OwnCloud software stack. It features data storage, music streaming (via webclient and android app over the ampache protocol) and connecting and sharing your content with friends. Installed software and features include Kwallet for security and simplified system settings plus Dolphin for file management. Software such as Firefox, Virtualbox and Dosbox come installed along with many other applications such as Tomahawk for music and Kate for text editing.